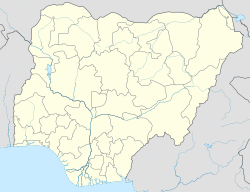 Agaie is a Local Government Area in Niger State, Nigeria. Its headquarters are in the town of Agaie on the A124 highway. It has an area of 1,903 km² and a population of 132,907 at the 2006 census. The postal code of the area is 911. ^ "The AGAIE EMIRATE". Nuhu Lafarma (Education) Foundation. Archived from the original on 2011-04-16. Retrieved 2010-09-01.